Poulos says investigators haven’t yet concluded how fast the bus was traveling. An Associated Press reporter says the red tour bus with white and gray stripes has most of its windows missing and a smell of gasoline hung on the air hours after Wednesday’s crash. Damage to the bus included large scratches on the driver’s side of the vehicle. The National Weather Service said trace amounts of snow had fallen in Memphis and west Tennessee cities by Wednesday afternoon. More snow was forecast to fall Wednesday night and Thursday in the region, with up to 3 inches (7 centimeters) possible in areas such as Dyersburg and Paris. Some schools in Shelby County also did not open or closed early due to heating issues. News outlets reported that Shelby County Schools called off after-school activities and Tennessee College of Applied Technology canceled evening classes. 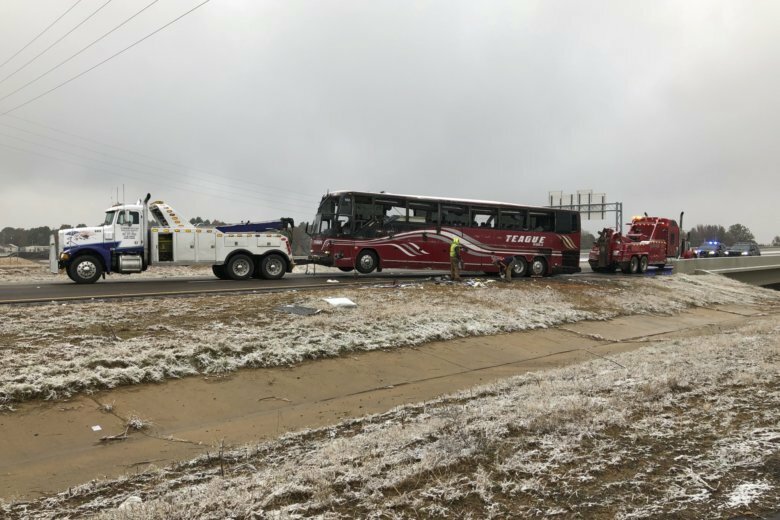 New outlets reported that several people were hurt when a tour bus overturned on a slick highway in DeSoto County, Mississippi, south of south of Memphis, Tennessee, where after-school activities were canceled because of the weather. The Mississippi Department of Transportation said there were reports of ice on roads and bridges in adjoining counties.